Any reader of my blog knows, I love a good QAL! So it was an easy decision to make blocks as part of the Quilter's Planner QAL. The April block is a Churn Dash - doesn't it look good with my three other blocks? This is my second calendar year using The Quilter's Planner and I really like it. I've always been a paper planner kind of person and this is by far the best paper planner I've ever used. The quality of the paper, the layout of the pages are just perfect for me. 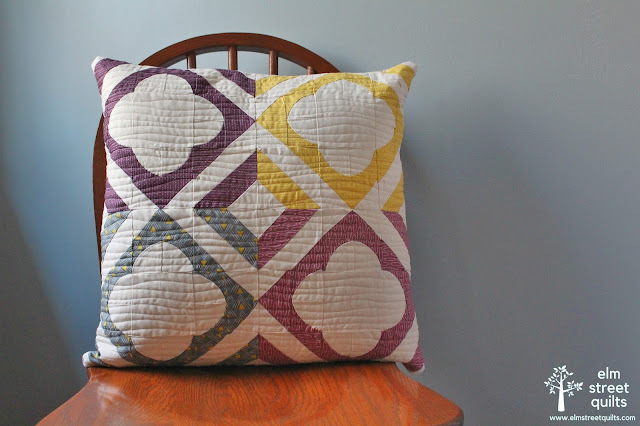 All the extra quilting adds - project pages, quilt patterns - just make it even more useful! Very cute pillow! I'll have to check out the Quilter's Planner. Adorable pillow. I'm a sucker for curves!